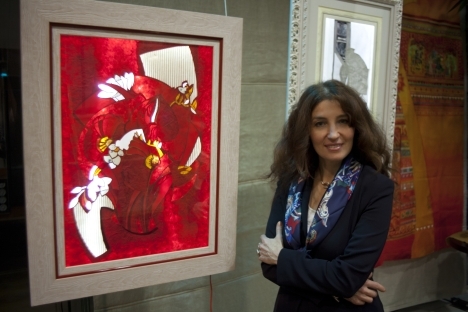 Evgenia Miro – a Russian artist from a Ukrainian background – had her first solo exhibition in Moscow. For the past four years, Miro has been living in France and working for world-famous luxury brands. RBTH took the opportunity to get acquainted with her. At the House of Hermès they produced Evgenia Miro scarves with a design called “The Russian Alphabet” and “Amusements”. Source: Alexander Berg, Sonya Anufrieva, Evgenia Miro. “It was dreadful to begin with. I was working on 15 projects simultaneously and only sleeping for three hours a night. In one-and-a-half months I had to turn out 15 designs. These days, of course, I've got more used to this stuff,” says Evgenia. Evgenia first arrived in Paris on the invitation of the French House of Hermès. While she had been studying at the School of Arts in London, she had shown her drawings to Hermès’ local office in the UK. They had given her letters of recommendation to bring to their Paris office, but, unfortunately she misplaced the letters. Still, the idea of collaboration with Hermès stuck in her mind. While she was in Moscow, a fashion house rated her work highly, and they asked her to create a design. “At our first meeting they asked me to produce 15 compositions on the theme of Russia. At that time there were no orders for designs for scarves. I had really wanted to demonstrate the multiplicity and richness of Russian culture, so of course I launched into creating 15 completely contrasting presentations of my Russian theme,” Evgenia says. At the House of Hermès they produced Evgenia Miro scarves with a design called “The Russian Alphabet” and “Amusements,” in eight colors for each design, along with enamel bracelets, brooches and dessert-tableware. Another one of Evgenia's important themes has been 'Time.' Her pieces were displayed at Moscow's “Oblaka” (“Clouds”) art-space on Kutuzovsky Avenue, where there was a large, white panneau in a complex shape, with black-colored drawings. The Paris Mayoralty allocated Evgenia a studio, where she hopes to set up her own atelier in the near future. “It will be a white studio with 3-4 workspaces, where we will be able to work on a number of different projects simultaneously,” says Evgenia. Evgenia's calling card in France has been her work for the House of Hermès, but this is far from the sum of her work. Evgenia's work has also been seen at Maisons Pierre Frey, Emaux de Longwy, Haviland, Beauvillé, and J.Seignolles in France, with Wedgwood in Britain, with different Italian companies and clients in Russia. Evgenia has a host of planned projects in both Russia and France. In early summer she will be exhibiting her work in one of Moscow’s top art-salons. In addition, she has been invited as a designer to the Flower Festival in Nice this August.